The tail of the AirAsia passenger plane which crashed two weeks back has been retrieved from the sea bed by the Indonesian navy. The divers who have been frantically searching for the flight recorders of the ill fated plane ever since it was confirmed to have sunk after crashing have not been able to find them yet. They are not thought to have fallen off on impact. Out of the 162 people aboard at the time of the crash, only 48 bodies have yet been recovered. The tail was found 100 feet below the surface and 20 miles away from the last known location of the plane. A team of divers used inflatable balloons to raise the tail from the seabed, then towed and lifted it on to a ship called Crest Onyx with the help of a crane. The data recorders of a plane (cockpit voice and flight data recorders) are help near the tail which is why locating and salvaging this part of the plane was of crucial importance to be able to determine the exact cause of the crash. The part has now been taken to the port of Kumai where it will assist the investigators looking into the matter. “Divers tried to find the black box while they were on the seabed, but they couldn’t see it. It might be due to poor visibility which [is] only three feet and also because of strong currents. Now it’s on the ship. 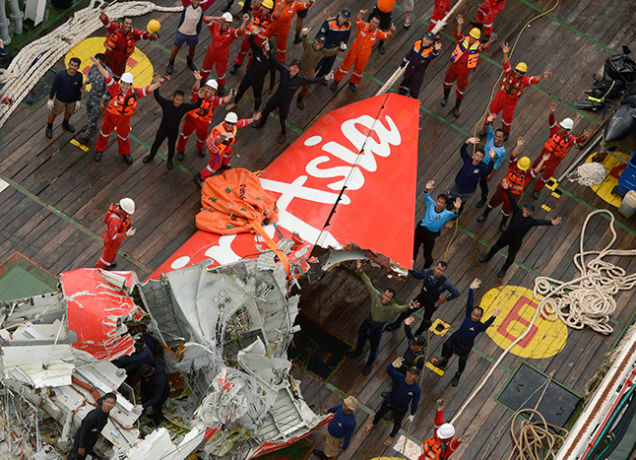 So we’ll try to figure it out whether the box is still on the tail part or has been blown away,” Supriyadi said. On Friday, divers were led to the tail after following pings believed to have been emitted by the recorders, but were later found to be coming from a place nearly half a mile away from where the tail was finally recovered. Black box data recorders, say experts, can survive even after being submerged in water and they give out pings for upto 30 days following a crash. Pings have increased hopes about being able to locate these recorders. Bad weather and the uncertainty about the exact point of crash have hindered the search efforts so far.